Arid and semi-arid landscapes are often laced with rapidly evolving networks of ephemeral gullies. These gully networks can act as significant sources of fine sediment, and their growth can undermine road systems, agricultural works, and other forms of infrastructure. In addition to these practical considerations, gullies are of great scientific interest as integral components of evolving landscapes. Yet the physics driving gully network evolution remain rather poorly understood at a quantitative level, raising questions such as how a gullied landscape might respond to changing climate or land cover. Here we report results from an integrated study of gully dynamics on the high plains of Colorado, USA. Gullies in the study area are typically bounded at their upper end by one- to two-meter high head scarps, and grade downstream into broad, unchanneled valleys. Analysis of historical aerial photographs reveals that gully head scarps in the study area have propagated at average rates on the order of decimeters per year over the past several decades. However, the timing and nature of the retreat processes are unknown. Traditionally, data on contemporary gully erosion rates are obtained using simple, single-point measurements of the distance of the channel head from a known benchmark. However, this method provides no information about spatial patterns of landform erosion or the volume of eroded material. In order to address these issues, high-resolution terrestrial laser scans (TLS) of a typical large gully head were collected in the summers of 2008 and 2009. Difference images between the two scans reveal a zone of concentrated erosion of up to 50cm depth along one meter-scale portion of the active head scarp. Other regions of the scarp face showed relatively little detectable change. The net erosion pattern emerged despite the existence of decimeter-scale noise originating from the grassland vegetation cover, demonstrating that TLS technology is applicable to active gully networks in grassland settings. The erosion data are consistent with a slab-failure mechanism for gully growth, as has been suggested for other settings on the high plains. The results illustrate the potential for improving process-response models based on detailed measurements of annual landform change. Bijou Creek has also become a testing ground for UNAVCO to try different scanners and scanning techniques due to its proximity to Boulder and the usefulness of frequent measurement time series. Several RESESS Proteges have conducted summer research projects using TLS data they collected at this site. Proteges include Emanuelle Feliciano Bonilla, Fernando Martinez and John Braswell. 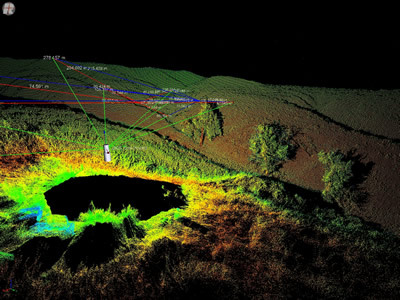 Figure 1 - TLS point cloud image of Bijou Creek study site. Points are colored by intensity of return. Vectors shown are from scanner to control targets. 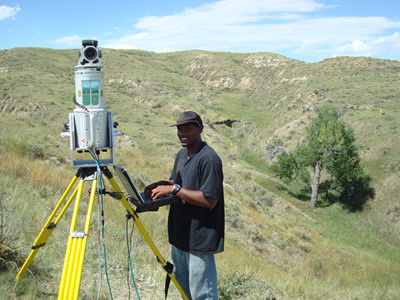 Figure 1 - RESESS Protégé John Braswell conducting TLS survey of Bijou Creek using UNAVCO’s Riegl Z620 scanner.